People have gained from the medicinal properties of greater plantain for thousands of years. Below is a straightforward guide to help you get to know how this herb might benefit you. Greater plantain is a weed that has been traced back to Nordic Europe, around 4,000 years ago. There, it is commonly known as groblad, meaning "healing leaves." References to its healing qualities can be found in early texts, including Dioscorides' De Materia Medica and Shakespeare's Romeo and Juliet, both of which talk about the herb as a way of repairing an open wound. The plant is still valued today in Chinese medicine and alternative Western medicine. Reducing the buildup of mucus in the nose and throat. It is thought that consumption of the herb in the form of tea can assist in the reduction of mucus and inflammation in the throat. Lowering cholesterol. The seeds of the greater plantain are a good source of soluble fiber, which can be effective in reducing cholesterol levels. Relieving inflammation. Substance from the plant can be applied to wounds, rashes, bites, and stings to soothe the affected area. The seeds of greater plantain contain minerals such as calcium, zinc, and potassium, as well as flavonoids and tannins, which have antioxidant and anti-inflammatory properties. The seeds are also mucilaginous, which means they are rich in soluble fiber. Both the leaves and seeds of the herb contain vitamins A (retinol), C (ascorbic acid), and K. These important nutrients help to keep bones and teeth strong, support eye health, boost immune system activity, and aid coagulation, allowing faster wound healing. Greater plantain is thought to be safe for external and internal use for adults and children, unless the user suffers from relevant allergies. It has been reported in the U.S. and Switzerland that some adulterated greater plantain products have caused some dangerous side effects, so checks should be made to ensure that the seller or producer is reputable. If the greater plantain is to be ingested, please note it may affect the absorption of other medications. It is recommended to consume the herb in conjunction with water. It is worth noting that sufferers of severe hay fever may be affected by greater plantain. It is advisable to check with a doctor before consumption of any natural herb, particularly for those who are pregnant or breastfeeding. Greater plantain is a fairly common weed, which can be easily grown and picked for household use. Its leaves can be enjoyed as part of a salad. Simply wash and consume directly as an efficient and tasty way to reap the many health benefits. This raw form is particularly recommended as a way to quickly absorb the nutrients that greater plantain has to offer. Medicinal preparations are made from the leaves and seeds of the greater plantain, but it can also be bought in various concentrated forms, which are more medicinally effective for treating specific conditions. Tea. Greater plantain tea is the most common way to consume the herb. It can be made using the leaves of a homegrown plant or teabags that are available to buy. Poultice. This can be made by crushing the leaves and seeds of the herb into a pulp and applying directly to a wound or irritated area. Its anti-inflammatory properties will relieve the skin and enhance the healing process. The poultice can be secured using gauze to be wrapped around if necessary. Tincture. This concentrated solution is another popular form of greater plantain. It can be bought or prepared at home. Dilute a few drops into water for drinking, or pour a few drops onto a cotton pad for topical use to soothe the skin. Ointment. This can be applied to broken skin to encourage healing and be used to reduce redness and swelling caused by bites and stings, as well as for soothing skin irritations and rashes. Oil. An oil of greater plantain is easy to make at home using the plant. It is another popular form to be used topically on problematic skin areas or insects bites. It is also considered to be a quality moisturizer. Capsules. 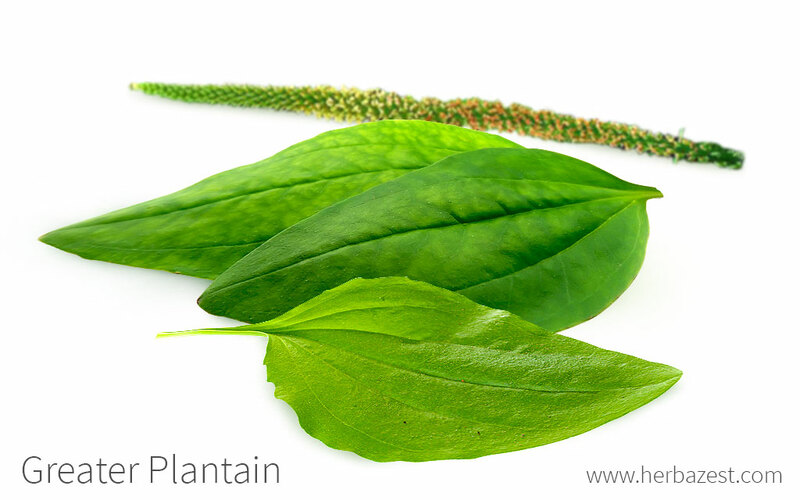 Greater plantain capsules are valued as a way of ingesting the herb for treating bronchial and respiratory problems. Greater plantain is widely available online and in health stores in the form of tea, which is made from the leaves of the herb. However, it is a very common weed that is easy to find in gardens, grasslands, and even along the roadsides. It can be picked and the leaves can be dried to make tea. The seeds can be bought online and in some gardening shops for planting and growing at home or for use in medicinal preparations. Tinctures, capsules, ointments, and oils can be purchased from many online retailers, and also health food shops. As a popular herb with a wide range of benefits, the different forms are relatively easy to find. Each will have different concentrations and uses, so seek advice from a health professional when deciding which is right. Greater plantain is a natural weed, and many consider it invasive and a nuisance. When wet, the mucilaginous seeds become adhesive, which means they can be distributed easily as a way to spread the herb. Greater plantain is a self-fertilizing plant that is easy to grow and requires little attention. Greater plantain grows to approximately six inches (15 cm) high. As greater plantain is a hardy plant, it can survive many different environments, including compacted soil and areas of drought, as well as areas with excess water. In a warm environment, the plant may flower throughout all seasons; however, in colder climes, it will usually flower between May and September only. After planting, it takes approximately 90 days before flowering, weather permitting. Growth is encouraged when the soil is compacted; for instance, in grasslands, the tread of livestock aids the plant. At home, regular lawn mowing and general use of the garden will be beneficial. In well-established plants, the rosette of leaves will be produced annually. These will die and retract back to the roots in cold weather. Detailed information about growing greater plantain can be found in the herb garden section. Greater plantain is a common weed that occurs across the globe in a range of environments. It is a short, perennial plant that consists of a rosette of dark green leaves averaging around two by five inches (5 x 13 cm) in size. These are usually smooth or have short hairs on them. Protruding from the center of the leaves is a relatively thick stalk that grows to a thicker cylindrical shape with small yellow-green flowers on. These will eventually go brown and dry, and a small capsule is produced below each one. This contains 6 - 30 small, black or brown seeds. Greater plantain is part of the Plantaginaceae family, which consists of around 1,700 accepted species of flowering plants across 110 genera, including other species of plantain, which are also widespread and commonly known. Another medicinally important herb in the Plantaginaceae family is turtlehead (Chelone glabra). The most well-known other species of the genus Plantago include P. lanceolata, P. media, P. maritima, and P. coronopus. P. lanceolata is considered to be another nuisance weed which is particularly abundant in the U.K. P. media is more aesthetically pleasing and is therefore thought of as a wild flower; P. maritima is a weed that grows close to the sea and on cliffs; and P. coronopus is another hardy plant that boasts several medicinal remedies not dissimilar to those of P. major. As mentioned, greater plantain originated in Nordic Europe. Europeans introduced the plant across the world, and it became known as "white man's footprint" by Native American Indians, as they said the flower began to grow wherever the Europeans had trodden. The scientific name of the genus, Plantago, is derived from the Latin word planta, which means "sole of the foot." The general opinion that greater plantain is a weed, and the fact that it can be grown easily in most climes and conditions means that this medicinal herb is not widely imported or exported. Supplements are largely produced in the U.S. and Europe - particularly the U.K. and Switzerland. The greater plantain is mostly valued for medicinal purposes, but its properties can be utilized in other ways. For example, due to the mucilaginous quality of the seeds, the pulp of the plant can be used as an effective cleaning agent on delicate areas. Greater plantain is often regarded as merely a nuisance weed, and therefore its medicinal properties are not taken advantage of. This is unfortunate as it has a lot to offer, and it is easy to prepare the teas and solutions required to use the herb for health benefits.